Bloom’s Fuel Cells: Just How Green Is a Bloom Box? Lindsay Leveen has been writing about Bloom Energy's fuel cell CO2 emissions for some time. Leveen is a chemical engineer, a technologist, an experienced consultant and the author of a book on hydrogen power and fuel cells. On the phone, he is reasonable and personable -- but on the internet, he's a bit of a, well, let's just say he's opinionated. Here is his blog. The blog takes aim at overhyped greentech companies with a focus on the John Doerr/Al Gore/Vinod Khosla axis of doom and its dastardly portfolio companies such as Bloom and KiOR. For those new to the story, Bloom is backed by more than $1 billion in venture capital from KPCB, NEA, and many other investors. 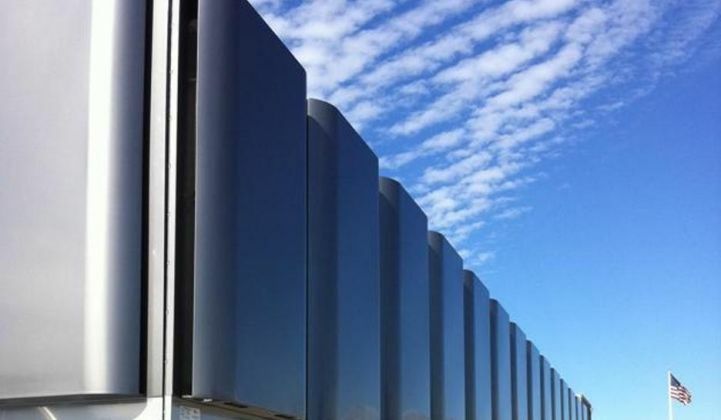 The firm's solid oxide fuel cell aims for distributed, combustion-less power with low emissions and grid-competitive pricing without subsidies. It does not yet achieve all of those goals. So, how does 884 pounds of CO2 per megawatt-hour from a fuel cell stack up against other power sources? The consultant's report for Delmarva Power notes that "large new natural gas combined-cycle power plants have heat rates of approximately 7,100 Btu/kWh. They can produce similar emissions rates as a fuel cell with respect to greenhouse gas emissions with somewhat higher nitrogen oxide emissions. Natural-gas-fired combined cycle plants can operate in baseload mode, but usually cycle for economic reasons. They consume more water than fuel cells." 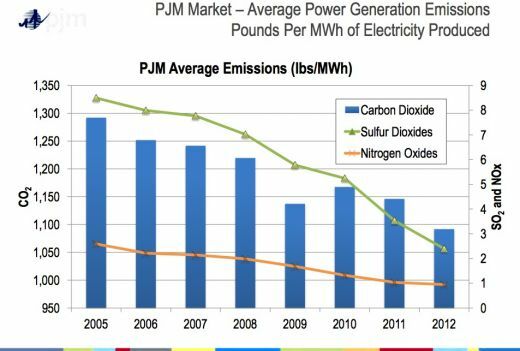 PJM's average power generation emissions in 2012 were about 1,100 pounds of CO2 per megawatt-hour (see chart below). 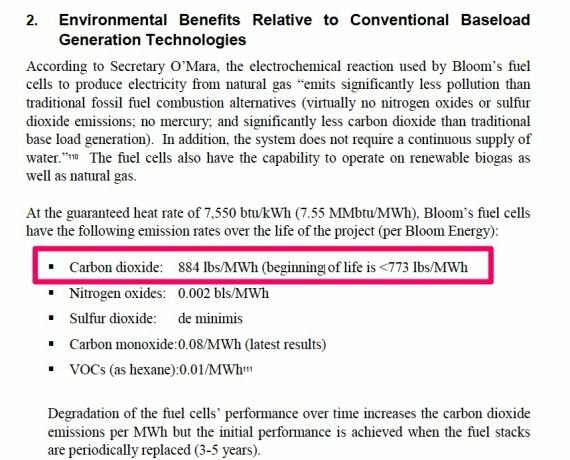 So, based on these numbers, a Bloom Box does in fact spew a bit less CO2 into the environment than an existing oil- or coal-fired plant. It's nothing to write home about -- but it's an improvement over coal. Whether it can be labeled "green" or "low-carbon" will become a matter for lawyers to hash out if Leveen and friends pursue legal action. Leveen points out, "A brand-new combined-cycle power station from Siemens, GE or Mitsubishi emits only 730 pounds of CO2 per megawatt-hour. The 47-megawatt Bloom station is at a substation [so it's not] distributed generation. The 47 megawatts of Bloom's cost in total capex [is] 470 million dollars. We could have had a 500-megawatt combined cycle plant for that -- that would have reduced Delaware emissions on 500 megawatts of coal, say, and really knocked down CO2 by a massive amount of, say, 0.3 tons per megawatt-hour generated. This is 150 tons an hour of CO2 savings. At 8,000 hours per year, this would have eliminated 1.2 million tons of emissions of CO2, and the power would have cost $60 per megawatt-hour, not $240." Leveen calculates the Bloom Box efficiency in the range of 45 percent and notes that a modern gas power plant is in the range of 60 percent efficient. Bloom also pointed to this recent whitepaper authored by the firm. Bloom's spokesperson said, "The 884 pounds per megawatt-hour is a conservative metric that was utilized for environmental permitting." The data sheet reads 773. The same contaminants in fossil fuel combustion, such as SOx, NOx, and H2S, can plague the Bloom Box fuel stack and have to be dealt with. H2S, according to Leveen, "is pure poison to the stack," and will be concentrated over a plastic resin bed. Leveen estimates that there will be five tons of toxic waste from Delaware's proposed 47 megawatts of fuel cell power production. 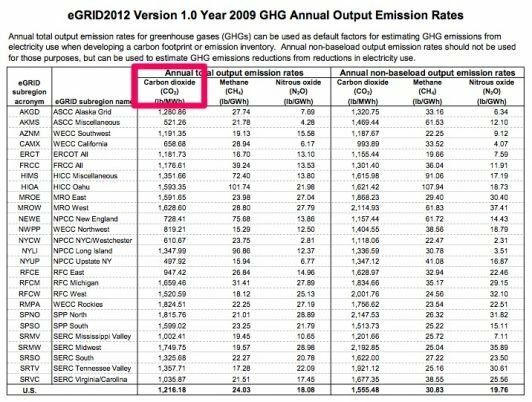 Here's a listing of GHG emissions by region from the EPA eGrid database from 2009.